McAllen Police Chief Victor Rodriguez, flanked by several law enforcement officials from the around the Rio Grande Valley, talks about SB 4 during a press conference held on Thursday May 11, 2017 at the McAllen Convention Center. McALLEN — Amid growing uncertainty in the Valley regarding the state’s anti-sanctuary cities law, the heads of local law enforcement attempted to assuage fears during a joint news conference Thursday. Speaking to members of the media in the Ballroom lobby of the McAllen Convention center, Hidalgo County Sheriff J.E. “Eddie” Guerra conveyed a message of cooperation between law enforcement and residents at a time when uncertainty about the effects of the law remains high. Texas Senate Bill 4, which Gov. Greg Abbott signed into law Sunday, gives local law enforcement in the state the power to investigate anyone’s immigration status during a lawful detention — including routine traffic stops. 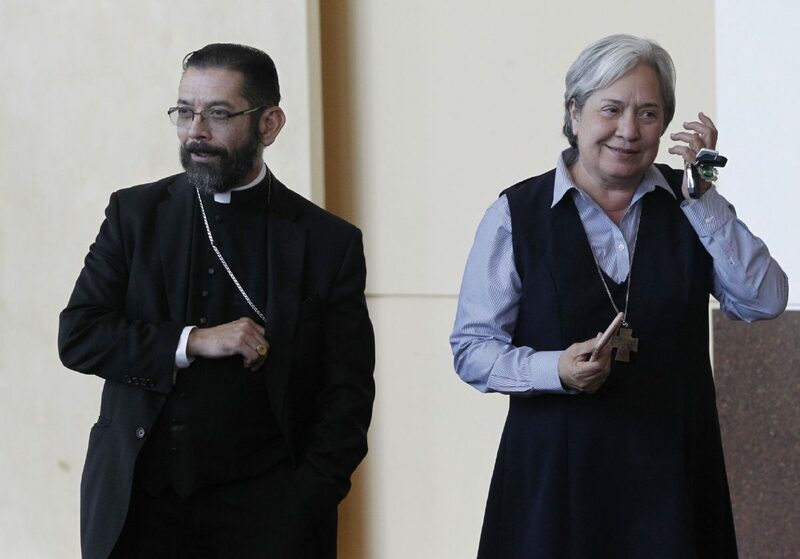 Bishop Daniel Flores and Sister Norma Pimentel emerge from a meeting with local law enforecment from the around the Rio Grande Valley before a press conference on SB 4 on Thursday May 11, 2017 at the McAllen Convention Center. “As Texas Gov. Greg Abbott has stated (SB 4) is simply a mechanism such that when someone has a criminal record, or who is also wanted by (Immigration Customs Enforcement), they are going to be detained and turned over to ICE, if you have not committed a crime, regardless of your immigration status, and unless you are subject to an ICE detainer, you have absolutely nothing to worry about,” the sheriff said. Guerra, who was flanked by the chiefs from Mission, McAllen, Edinburg, Pharr, and other local agencies, said SB 4 does not change anything for law enforcement in the Valley because they already allow their officers to use their discretion as it relates to immigration status’ checks during lawful stops. Noticeably absent from the joint briefing was the Texas Department of Public Safety — whose troopers have become an almost permanent fixture in the region since the state boosted their numbers in 2014. “We are here today because we want to let the residents know that Senate bill 4 does not grant our deputies or police officers with the authority to enforce immigration law, or to deport undocumented immigrants,” Guerra said. Instead, he said it prohibits departments from imposing specific guidelines regarding immigration status inquiries. The immigration status check can be done if an officer feels it necessary to ask, District Attorney Ricardo Rodriguez Jr. said. Guerra, to illustrate better how an officer may use discretion, gave an example of a traffic stop and the three options an officer has in any given situation; pointing out that this has been the standard since he became sheriff more than three years ago. “(During) a simple traffic stop — if the officer feels that he needs to ask the immigration status of that person, the officer still has the option of doing certain things — issue a written warning, issue a citation, or arresting the person — they’ve always had that option,” Guerra said. 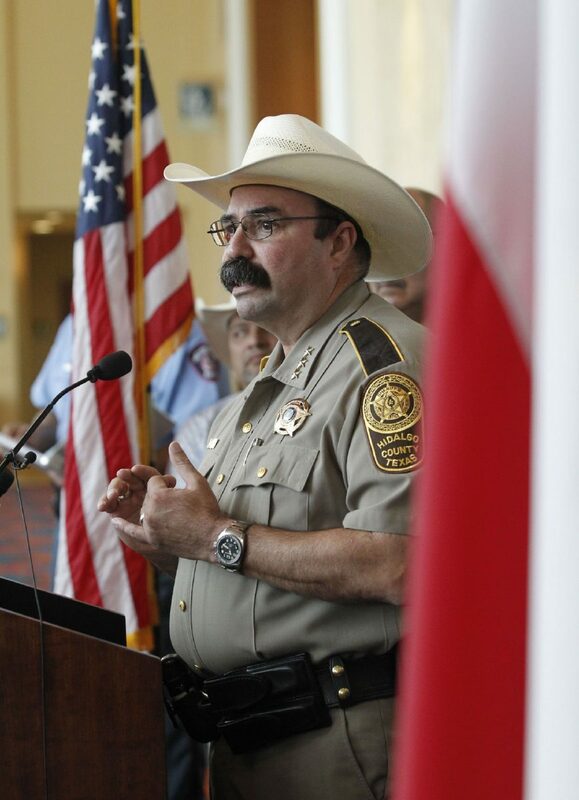 Asked if the new law could possibly encourage some officers to ask more frequently about the immigration status of someone during a lawful detention, the sheriff said he has yet to receive a complaint from the public of that sort of abuse. “I have not received one complaint from any of the people that we serve complaining about an officer that they were being discriminated against. The law is very clear about discrimination — the law prohibits racial profiling and discrimination, any officer regardless of which agency they work for, found to be discriminating against someone based on nationality or race, would face severe consequences,” Guerra said. The law prohibits officers from checking the immigration status of anyone who is a victim, witness, or is reporting a crime. “We want to assure the community we serve that we will always prioritize their protection and safety from the criminal element that never rests,” the sheriff said. Cooperation among federal, state and local law enforcement will remain in place, the chiefs said. “We’re not changing from blue to green (uniforms),” Edinburg Police Chief David White said, referring to the green garb synonymous with Border Patrol agents. 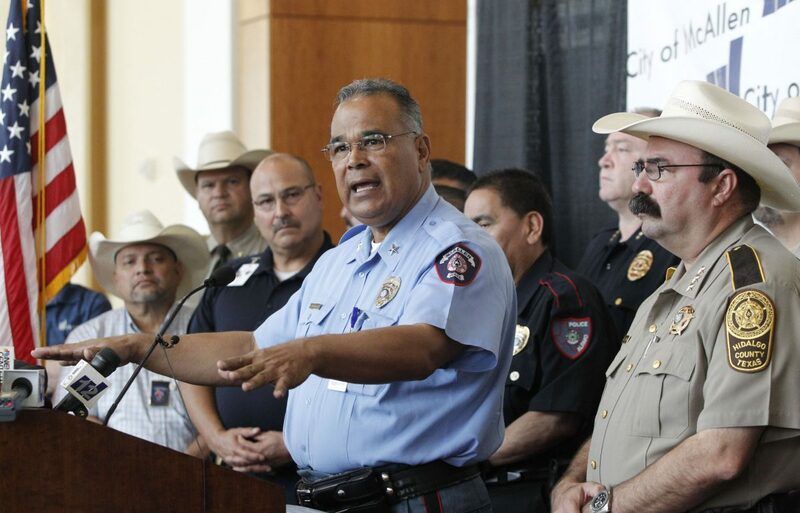 Bishop Daniel E. Flores, of the Diocese of Brownsville, said at the conference that he appreciated the heads of law enforcement making a point to address the public at large about the laws’ effects locally. The bishop, who in the weeks leading up to the bill’s signing had been speaking out against it, said he said he hears from members of the undocumented community who fear doing simple tasks like going to the grocery store, because of the vagueness surrounding the new law. “I’m hearing, ‘I’m not going to the store unless I’m going to walk because I’m afraid I’m going to get stopped for whatever reason,’” Flores said. He said he appreciated the message from law enforcement because it starts the process of clearing up the uncertainties about the law, which is crucial in an area like the Valley where a heavy law enforcement presence has exited for years. Juanita Valdez-Cox, executive director for La Union del Pueblo Entero, a local immigrant advocacy organization, released a prepared statement in reference to the Thursday morning conference. Valdez-Cox, who said she was not made aware of the conference beforehand but watched it via video, expressed concern about the message conveyed. “SB4 erodes community trust and safety by compromising relationships between law enforcement and the people they are pledged to protect and serve. By preventing local cities and police departments from limiting their entanglement in immigration enforcement, the law drives a wedge between local communities and the police and undermines community safety,” Valdez-Cox said. The joint conference comes days after the American Civil Liberties Union issued a travel alert for people making planning on traveling to the state. The ACLU said the law could lead to widespread racial profiling and the possibility of illegal arrests of both U.S. citizens and non-citizens alike. The message conveyed by the group of chiefs Thursday was of a continued partnership between all entities to provide public safety to the entire Valley. Despite a news release that stated the conference Thursday would be about the lack of training local law enforcement has regarding immigration status and reviewing immigration documents, those topics were not brought up by either McAllen Police Chief Victor Rodriguez or Guerra. McAllen Mayor Jim Darling, fresh off his recent win in his re-election bid, addressed foreign businessmen and travelers of the area, saying they should not fear visiting the region. “Especially to Mexican visitors to our country, if you were safe coming here yesterday, you should feel the same way today, I think that goes for all of our citizens as well,” the mayor said.